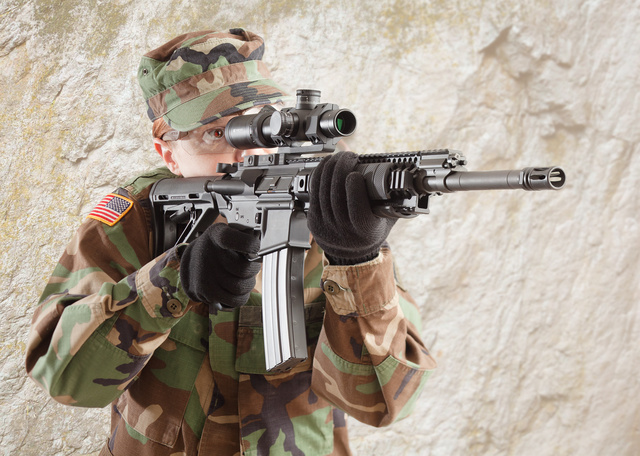 This entry was posted in rifle and tagged 6.8mm, Army, camo, optics, woman. Bookmark the permalink. A little short for a stormtrooper.. sorry, grunt..
My AR is equipped with a Vortex Viper PST, 4×16-50, with MOA reticle and turrets. I’ve got it mounted in American Defense, QD integrated base & rings. All in all, it’s a setup worthy of your time and trouble to review. I can only give the whole setup the highest praise, save for one tiny gripe. The “off” position of the reticle illumination exists between “full value” clicks of the illumination intensity. The detent on these is too “soft”, and the illumination can be “bumped on” quite easily, thus rapidly (and unknowingly) draining the battery. A better solution would be to leave the clicks as just “full value” clicks, and have a “pull ON to illuminate” dial. Then, if it’s “bumped”, it’ll likely bump it inward, toward the scope body, thus turning the unit OFF. Otherwise, the optic is near-perfect, edge to edge, with no barrel or pincushion distortion, chromatic aberration isn’t visible to my eye, resolution is razor sharp to the furthest range I’ve had available (800 yds), and the mechanical repeatability of the adjustments is simply World Class, returning to Zero after shooting the proverbial “box”, in both directions. I’ll likely not keep the PST on the AR, as it’s a bit large and overpowered for the application, but I did use it to ascertain the rifle’s maximum accuracy potential. The scope will likely find a home on a upcoming commercial Mauser ’98 project. In short, my vote for Vortex products? HELL YES!